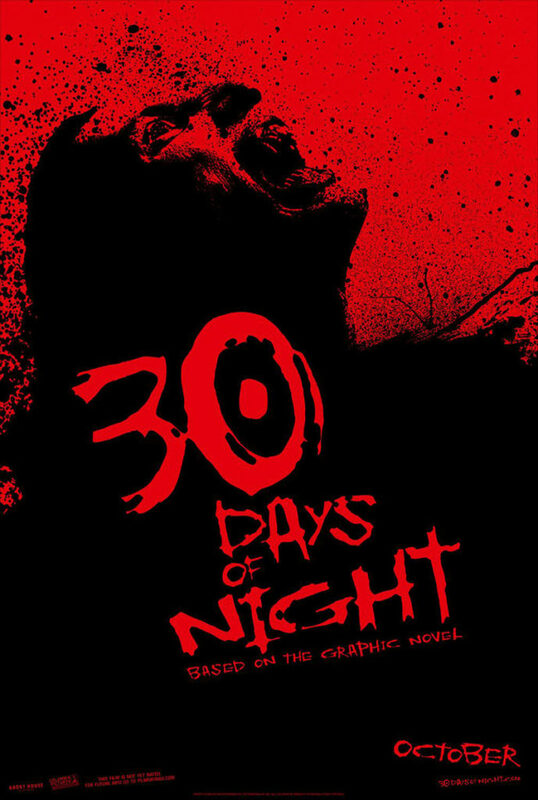 The film 30 Days of Night, adapted from the popular graphic novel, was marketed as a modern update on classical vampires. A break from pattern, these creatures of the night were more fearsome, more violent, more bloodthirsty, than any that had been onscreen before. Indeed, the vampires of 30 Days of Night are not Anne Rice’s cultured charmers, nor are they the stealthy apparitions of Bram Stoker, although their physical appearance pays homage to the Dracula of the classic film Nosferatu. These vampires are more animalistic, with little inclination to wipe away the blood after a successful hunt. They speak a guttural language meant to evoke an ancient mystique, with faces twisted into grotesque snarls. They maintain only a tenuous connection to humanity. In fact, they can hardly be considered human at all, vampirism becoming more than just an affliction or a state of mind. Here it is an addiction that changes a person into something else, a different species born from man, yet not of him. Everything about them is more, but it’s not new. For the characters in the film, it is akin to the difference between legend and fact, where all the cultural knowledge one has absorbed about vampires encounters a reality that lacks the politeness built up by layers and layers of popcorn horror. So, as far as the monsters in the film are concerned, mission accomplished. If there is a failing with the vampires, it is that in trying to establish a new kind of movie vampire, at times the filmmakers have instead given us suped-up zombies. They are fast and strong, unlike typical zombies, but they are one-dimensional, killed by methods used in zombie films, and have the ability to spread their condition with a bite or a scratch, setting up the tired, obligatory scene from zombie fare where one of the good guys gets bit and subsequently has to be dealt with. The film is set in Barrow, Alaska, after the last sunset for a month. Barrow is the northernmost town in the United States. Every year, the sun dips below the horizon in late fall and doesn’t rise again for about 65 days. Any 24-hour period is never completely dark, midday becoming twilight. For the story, the facts were twisted a bit, and the sky becomes as black as pitch for thirty straight days. It being perpetual night, so to speak, the vampires have themselves a ready feeding ground, where they are free from all constraints placed on them by the deadly rays of the sun. The assault on the town is quick and gruesome. The vampires tear into the inhabitants with gusto, driving survivors into hiding, their continued existence dependent on the rising sun that is still weeks away. The premise is chilling, and while not handled perfectly, conveys the desperate nature of the townfolks’ predicament. The film establishes quite well the wintry vastness of northern Alaska in its opening scenes. When it shifts to a soundstage as night falls, the closeness in the darkness becomes stylized (Hollywood still has yet to make artificial snow that can withstand close scrutiny). Imagery seemingly lifted straight from the tableau of dark and moody music videos sometimes reminds the viewer of the prop location, but the look of the film maintains a close consistency throughout that works. The world out past the darkness has disappeared. It’s a claustrophobia that hangs on for the balance of the film. The violence is graphic. At times, it’s disgusting. Whether it’s simply unnecessary or plain repellant depends on a person’s stomach. Disturbingly, the vampires are not responsible for the worst onscreen instances of it. The two main adversaries of the film, Josh Hartnett as Sheriff Eben Oleson, and Danny Huston as vampire leader Marlow, both give credible performances. Hartnett takes some time to grow into the character and pick up some speed. Once his character’s stress levels ratchet up, the natural tightness Hartnett carries fits right into what the performance demands. Huston is creepy from the outset. His character doesn’t spend any time in zombie mode, and he does well portraying abject evil. His Marlow has no sympathy for people he sees as little more than cattle. Any interaction he has with the townsfolk is a strictly one-sided relationship, used to reaffirm his already fierce views of the inferiority of mankind. The film’s central idea is stronger than its execution, despite all the things the filmmakers did right. It doesn’t slip all that often into the laziness of pattern horror films, but it does slip. The collection of little fault lines in the plot keeps 30 Days of Night from reaching its full potential. It’s tempting to rip into the outlandishness of the story until one remembers that there is no basis in reality for a comparison. Mistakes that we see characters make are not based on decisions we would make in similar circumstances, but on what we have been programmed to expect by the vampire genre of film itself.